What’s the difference between a regular roof and a flat roof, and why does it require different material? The key is in the word flat. When a roof is flat (it actually will have a very slight slope) water is going to spend a lot more time in one place – giving it more time to find a way underneath the roof surface and into the structure. So rather than a roofing material (like shingles) that simply lets water run down it, you need a roofing material that offers a completely waterproof barrier. Hence why waterproof decking is popular. As a multi-ply PVC membrane, vinyl surfaces can hold up to the rigours of continued exposure to water, heat, wind, etc. Why Not Other Options for Waterproof Decking? Asphaltic Tar: Yikes! Talk about hot and smelly – not the best solution if you want to enjoy a nice day on your roof deck. The materials used are also heavy and can clog up your gutters and drains. Torch on/ Modified Bitumen: Again, probably not the best option for the same reasons above. If you did want to convert your roof to this surface you would need to add a finishing product on top, for an additional cost, rather than just covering with PVC vinyl decking in one go. Built Up Roof (gravel): This option looks ok (gravel on top) but probably isn’t very comfortable to walk on and can be pretty heavy. Spray On Coating (silicone): This is a pretty expensive option used primarily in commercial applications. Although it offers great waterproofing since it’s seamless, it’s not meant to be walked on and doesn’t look that attractive (usually plain white or grey). If you already have one of these types of roofs, you *could* potentially cover the existing roof with PVC vinyl decking (on top of a flat, hard surface), but you’re much better off taking the roof down and starting over with a high-quality vinyl decking material. 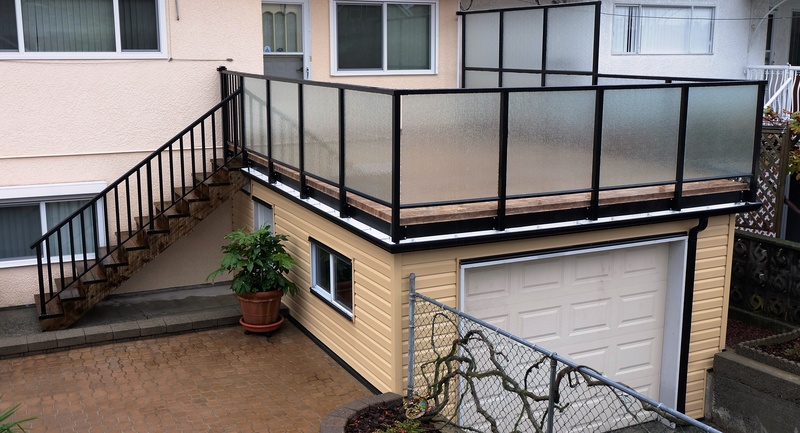 There are a few things that make PVC decking different in regards to roof decks. First, it’s designed to be waterproof and walkable – whereas most other flat roof materials are not. It also incorporates CoolStep™ technology so you don’t burn your feet (and can also potentially lower your cooling bills in the summer). When installed professionally, a vinyl roof deck surface incorporates into the structure of your home, condo, or commercial development. This method means that you get waterproofing from end to end – not just on the surface. By incorporating the vinyl surface into the structure you’re leaving much less room for water to find a way in. Vinyl Decking Looks Great on Roof Decks! Previous options for roof decks were pretty drab in flat greys, whites, and beige. Luckily, today’s printing technology allows you a variety of choice so you can create an enjoyable outdoor living space. Whether you prefer the look of stone or wood, there is likely a type of vinyl surface that will suit your style and your space. Once installed, a PVC vinyl surface will require very little maintenance and could last you 10-20 years or more! How is the Guarantee of Flat Roof Decking? If you’re familiar with the saying “the proof is in the pudding” then you’ll like our take on it: “The proof is in the warranty!” While you’re welcome to shop around, you’ll find that when it comes to flat roof decking products, the warranty on Tufdek™ PVC vinyl decking is one of the best in the business. If you’re looking to maximize peace of mind when it comes to your roof deck, check out our vinyl surface warranties. The next step is to get a Tufdek™ certified contractor to come and take a look at your flat roof to see if a vinyl roof deck is in your future. We hope you enjoy it (never mind, we know you will! ).